As a Disney lover, I’m always thrilled to find food mentioned in the original books that featured in the Disney movie (rare, but it happens). In this case, lucky us, the ‘big pawpaw’ sung in the Bare Necessities is also mentioned in the book (although no prickly pears). 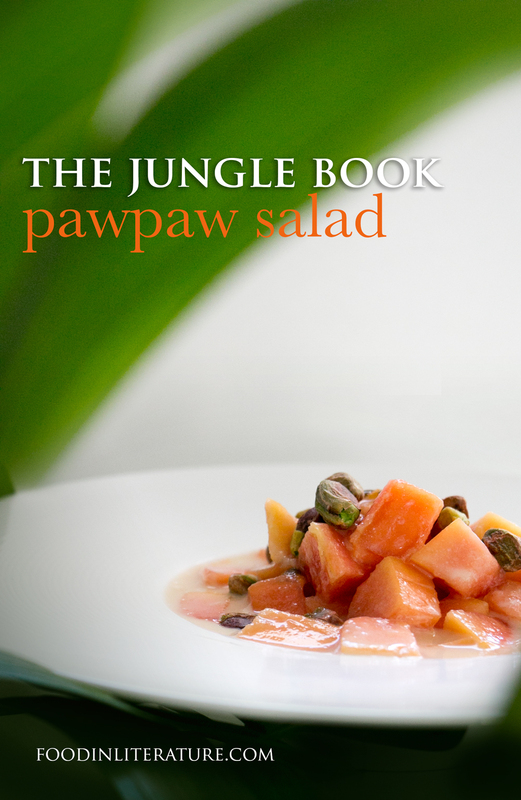 So a juicy pawpaw salad seems just the treat for the new Jungle Book movie that’s coming out this year. Now, it seems that if you eat pawpaw (also known as papaya) outside of a location where it’s grown fresh, you’ll find it bland (or so it seems from reading lots of forums). If you’re one of the lucky few, you can leave out the sugar in this recipe. The sweet papaya can hold its own. For the rest of us, white sugar will be required, which, yes, makes it less healthy, but more palatable. I’m also taking inspiration from the fact that Baloo lived on ‘nuts, roots and honey’, giving us more ingredients to work with, while still staying ‘true’ to the book. Skin the pawpaw with a potato peeler, scoop the seeds out of the middle, and slice into bitesized cubes. Pour over top the coconut milk, passionfruit pulp, lime juice and pistachios. Give it a good mix, then sprinkle the sugar all over the papaya, then serve.